It has been said that knitting is the “New Yoga”. Indeed, just as the sustained movements of Yoga relax and calm us after a hard day’s work, the steady repetition of knitting soothes our harried minds and help us escape our hectic technology driven lives. In addition to making our hands industrious, it has been suggested that knitting bestows health benefits as well. 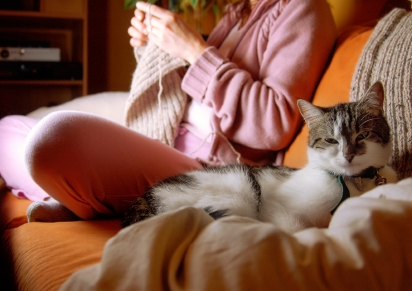 Dr. Herbert Benson, author of The Relaxation Response, has proposed that repetitive muscular activity, such as knitting, induces relaxation responses, decreasing heart rate, blood pressure and muscle tension. Evidence also hints that knitting, like other creative or social activities, keeps our brains alert. In fact, one study of people 65 and older, found that consistent participation in social or leisure activities such as knitting or gardening were associated with a lower risk of dementia. Knitters have written countless testimonials on the beneficial effects of knitting at the UK Hand Knitting Association web site. They’ve related experiences about how knitting offered therapeutic distractions from illnesses and bereavement and how it reduced stress and fostered companionship when done in groups. Knitting has faded in and out of popularity over the last two centuries but is currently enjoying a mass revival. According to the Craft Yarn Council of America, the number of U.S. women knitters, ages 25 – 35, has seen an incredible 150% increase within a two year span. Today knitting is less about mending and more about individuality, social enjoyment and a sense of community. Knitting is an escape valve for blowing off the steam of life’s harried pace. It’s a tangible way to connect with the past and present as well as a means of creating practical and beautiful apparel and household items. In today’s technological world of food processors, bread machines and online books, tangible pleasures like crocheting and knitting are often left behind. But there’s something undeniably special about the feeling of soft yarn in your hands and the healing tonic of steady stitches. It’s a form of natural therapy that you just can’t get with the push of a button or the click of a mouse. The Continental Stitch understands the value and popularity of knitting in today’s increasingly busy world. That’s why we provide a beautiful, relaxing environment, for knitters of all levels, at our convenient location in Historic Morgan Hill, CA. Come enjoy the therapeutic benefits of knitting as you learn, relax and socialize!